Now You Have the Chance to Get It Back. Before the financial crisis, earning yield was simple. Invest your money in 5-year CDs or 10-year Treasuries and safely earn 4%–5% per annum. For those who rely on income for their retirement, it was a risk-free, “invest it and forget it” strategy. But when the crisis hit, the Fed took a hatchet to interest rates... and to those opportunities. While the Fed is now raising rates, those same instruments only yield around 2.8% today... which means we would have to get another five quarter-point rate hikes before 4% yields make a comeback. Now ten years into the economic expansion, the smart money is betting we will enter a recession before that happens. Faced with the “lower for longer” problem, investors have been forced into dividend stocks and low-grade bonds to earn returns. While their need for yield has been fulfilled, they’ve taken on huge amounts of risk in the process. 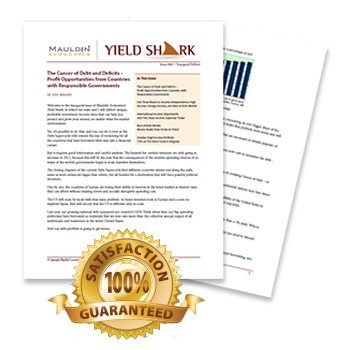 Yield Shark is the Mauldin Economics’ flagship publication that’s been helping readers generate superior yield and lower their portfolio’s risk exposure. Our readers are earning 2–3 times the yield offered by Treasuries and dividend stocks today... and here’s exactly how we help them do it. Every investor knows diversification is important. Never put all your eggs in one basket. That’s good advice, but doing it right is harder than it sounds... and doing it wrong can be very expensive. That’s not just our opinion. It’s simple math: Recovering from a loss is harder than avoiding the loss. A 10% gain doesn’t bring you back from a 10% loss... that would require an 11.1% gain. You may say “what’s a percent or two?” No big deal. But the bigger the drop, the bigger the hole you then have to pull yourself out of. And if your stock drops 90%, you’ll need a 1,000% gain, one of those rare “ten-baggers” Peter Lynch used to talk about, just to get back to where you started. In Yield Shark, we spread our exposure across many asset classes and sectors. 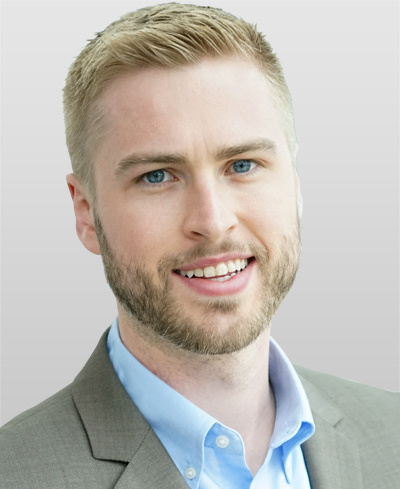 In order to find the best investments, Robert and his team use advanced financial modeling and boots-on-the-ground research to find an edge for his subscribers. If de-risking your portfolio and investing in undervalued high-yield assets is something you want to do, we're happy to help. When central banks lowered interest rates to historic lows in the wake of the financial crisis, investors were forced into dividend stocks to generate meaningful returns. In 2017, Research Affiliates found that dividend stocks are more expensive than they’ve been over 80% of the time in the last 40 years. Buying these stocks at such lofty valuations means taking a big risk. A sharp decline in share prices would dwarf any income received from dividends. With the average dividend yield on the S&P 500 now below 2% and prices at all-time highs, most dividend stocks may end up being a safety-minded investor's worst nightmare. The keyword here is most. We subscribe to the idea that there's always a bull market somewhere. Even with markets at all-time highs, there are still plenty of opportunities in dividend-paying stocks. And this is a strategy that has worked. Since Yield Shark’s inception in 2012, the portfolio has generated an average 7.73%* gain for readers. These returns have made a huge difference to our reader’s portfolios... and there’s nothing stopping our team from doing the same for yours. Notice, that we said markets are mostly efficient, not always. Identifying inefficiencies is one of the best ways to gain an edge. The odds that North Korea will fire a nuke at Los Angeles are pretty low. But the consequences are so terrible that even if the probability is only 0.0001%, the government will spend massive amounts of money to prevent it from happening. This “inefficiency” is one of many that have contributed to the profitability of our defense holdings... like the 57.73% gain we made on Boeing (BA), the world’s sixth-largest defense contractor, in March 2017. We’ve also seized the opportunities created by a decade of artificially low interest rates. Money has poured into the real estate investment trust (REIT) sector in the past few years for its handsome dividends... Exploiting this trend, we made a 54.6% profit when we closed our position in Weyerhaeuser (WY), a timberland REIT in June 2017. Robert Ross is the senior analyst and editor of Yield Shark at Mauldin Economics. Robert’s approach to uncovering opportunities for his readers is two-fold. His on-the-ground experience in dozens of countries over five continents helps him see firsthand the opportunities which merit further research. Then his exceptional analytical skills are put work. Robert created the proprietary Mauldin Economics Equity Evaluation System (EES)—a sophisticated tool he uses to analyze equities in-depth before recommending them to his readers. The EES compares over 100 different qualitative and quantitative criteria to pinpoint the companies best positioned to take advantage of each opportunity. An evaluation showed that companies with an EES score above 50% produced average returns nearly 17-times greater than the Dow Jones Industrial Average over the same period. Robert’s field investigations, coupled with his EES expertise have helped him provide thousands of Yield Shark readers with low-risk returns. With Robert and Mauldin Economics’ team of experts behind your portfolio, you’ll be poised to generate market-beating returns... and won’t have to worry about finding decent yield ever again. If you want to earn market-beating yield, but never want to compromise on the quality of your portfolio, become a Yield Shark subscriber today. As a subscriber, you’ll receive the monthly newsletter issue—published on the last Tuesday of every month—along with timely, periodic alerts if market developments require fast action. There’s no risk in trying it: You have a full 90 days to decide if Yield Shark is right for you. 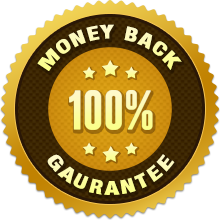 If you’re less than 100% satisfied, for whatever reason, simply cancel within those 90 days for a full, prompt, and courteous refund—no questions asked. Even if you miss the deadline or decide to cancel after the 90 days are up, we’ll still give you a prorated refund on the remainder of your subscription. 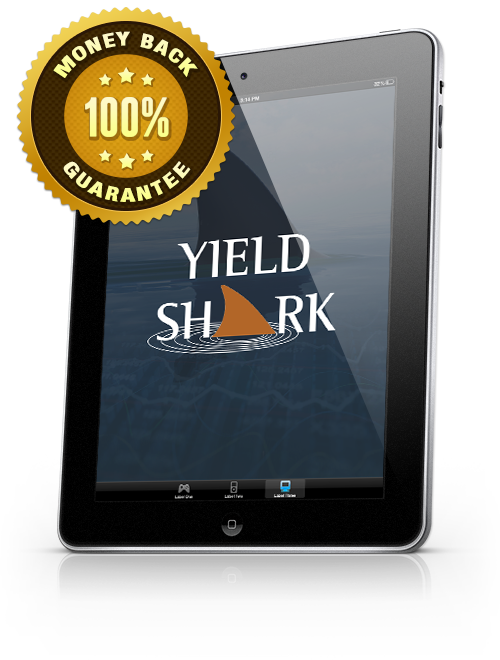 So you have literally nothing to lose by trying Yield Shark. Your gain, on the other hand, could be significant. There is absolutely no risk in trying Yield Shark. You have a full 90 days to decide if the service is right for you. 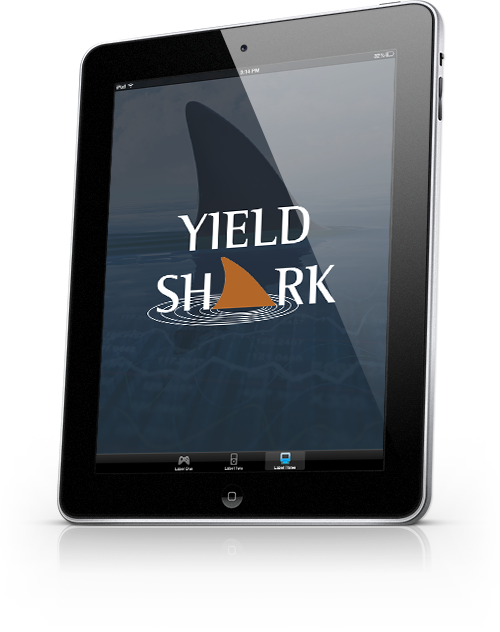 Give Yield Shark a try today. Getting started is easy: Just fill out the order form below to get instant access to superior yield and lower risk.